Okay, so maybe it's not REALLY cheating, but I feel like I'm cheating since it's SO easy and fun! Remember when I told you that I dropped by my friend Nancy Morgan's house, and Nancy Littrel had left this stamp set? This is one of the techniques that Nancy showed me... which Nancy L. showed her, which I think she was taught by the amazing Leslie Miller. I've never been that great at watercoloring with reinkers and a brush. It seems I can't get the right amount of ink.. either too much or not enough. So, this is why I was THRILLED to learn how to do this.. and now I'm in love with my Stampin'Up! markers... at least with watercolor paper. *wink*. Yep, you heard me... 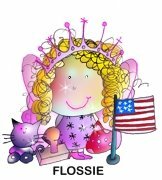 I used only my Stampin' Write Markers and my Aquapainter. Am I the last one to know about this? It seriously took under a minute, and it was a no brainer. I love no brainers... I NEED no brainers. Stamp your image on watercolor paper with Stazon ink (or emboss). Take your marker with the brush tip and draw on the lines in the image that indicate the shadowing. *Click on the image to see a larger version of the photo. * I colored the stem of the flower with the fine point tip. Take the Aquapainter (or paint brush) and move the ink from the shadowed areas to the outer areas. Blend as much or as little as you want. If you get an area too dark, just dab the area with a paper towel. If you need more ink, go back again with your brush tip and add more to the shaded areas again. Touch the tip of the Aquapainter to a tissue or paper towel until the red is out of the tip, then move on to the old olive on the leaves. It's okay to leave a little white area too. Wham Bam, Shazam, DONE! Omgosh... how easy is that? The more it dries, the more it just pops from the paper. Can you believe it? Two markers and a Aquapainter! Just dab with tissue if you get too much water or ink. Copics do not work well with this technique. You can use Copic reinker to "paint' with but you will not get the same results by using Copic markers to color directly on to watercolor paper. 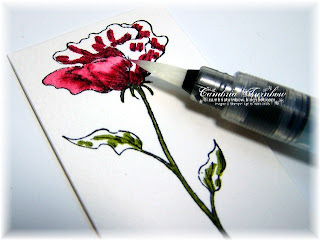 Stamps: Bloomin' Beautiful (Stampin'Up! 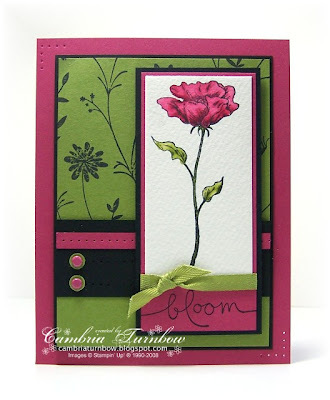 ), Pretty Petals Background Stamp. Paper: Watercolor Paper, Rose Red, Old Olive, Basic Black. 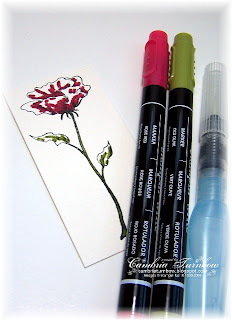 Ink: Black Stazon, Rose Red & Old Olive Stampin' Write Marker, Black Craft Ink. Other: Poly-Twill Olive Ribbon, Dimensionals, Rose Red Brads, Vintage Brads (second card), Circle Punch, Aquapainter, Crafter's Tool Kit, Photo Corner Punch,Stamp-a-ma-jig (second card), Scor-Pal. Hope you all had a great day. Thanks for stopping by! If you try this technique, I'd love for you to leave me a link so I can see! These cards are beautiful, love the colors you used. This is fabulous! I definitely need to try this. Thanks for the step by step instructions. Absolutely gorgeous!!! I have to try this!!! This is a beautiful card..I love the colors you used. Oh wow, love this card & LOVE teh technique! How easy! 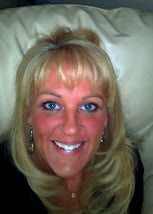 PS, You have been tagged by me on my blog! Your cards always inspire me & I love your sense of humour! Hope your gramma is doing ok now! These cards are just beautiful!! Thanks for demonstrating the watercolor technique. I've never been able to get it to look as good as your's did. I love the look using this technique. Thanks so much for the tutorial! Cami, this is great! I swear I have to have been living under a rock. I've been stamping for 7 years and have never seen this done. Can I say "DUH?!" That's fantastic!!!! I'm gonna have to share this with others. THANK YOU!!!!! Oh, and the card is beeautiful, too. Nope, have never seen this technique before. You are da bomb for showing all of us! This just goes to show you that you should assume nothing! You must always show us all of your tricks! You rock! Love both of the cards! Have I used enough exclamation marks?!!!!!!! I guess I'll be a WC Cheater. Thanks for the tutorial. I have never been successful with watercoloring. Hopefully this will change all that. Nope - you're not the last one! I have to try this technique out. 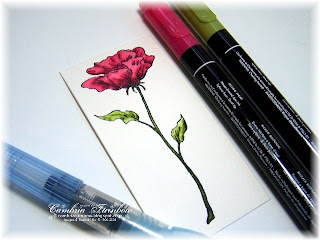 I love using the watercolor paper and this looks a lot easier than dabbing on the stamp pad with the aquapainter. MUST TRY. Thank you! These are gorgeous! You may have just pushed me over the edge on this set! WOW Cambria!! This is gorgeous. I had not heard of this watercoloring technique. Thanks for sharing. I am definitely going to try it. Wow! I have used my su markers to water color but not like this! TFS! Thanks for sharing. You got a really beautiful result! Super tutorial and a beautiful card!! 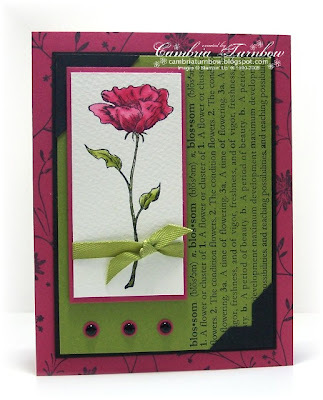 Beautiful card Cami! I have done this before but you have refreshed my memory!!! Wish I had this set now! Absolutely fabulous! I use this technique a lot because I refuse to buy the Copics.....thanks for the inspiration and stunning card! No, you aren't the only one who didn't know about this watercoloring method. I'm going to have to try it today! Thanks! I did, however, finally get my Sushi set :)!! Posted my first sample today, check it out if you get a minute. Beautiful cards! Thanks for the reminder to pull out my watercolor paper. And I'm all for quick cards; TFS. WOW, that's really COOL....thanks for the info Cami!!! Gorgeous card too!! I love to watercolor and use paint, H20`s but now I quess I need to buy markers. Your coloring turned out great. Thanks for showing this---I have been told I could do this, but I haven't seen a tutorial. Since I don't have those COPICS, this will really help! Your card is beautiful! Thanks so much for the tutorial. I do not have too many SU markers but I have enough to do this. GET OUT CAMS! BRILLIANT! Thanks for sharing! I love cheating! Thanks for sharing this awesome technique!! I've gotta try this one out - and your card is dazzling!! Love it all! Hi, Cami! I had to come check it out...it looks fabulous! So quick and easy. Great tutorial and absolutely beautiful cards! I've seen this before but only tried it with whisper white. The real trick must be the watercolor paper then. Goo to know. Have to add that the flower turned out gorgeous! Oh wow - great cards. I love the colors! Stunning card Cami! The colors are amazingly beautiful! Maybe I don't need those Copics afterall. Hmm. It's GORGEOUS! I love this technique - SUPAH easy! I neeeeed supah easy! Love ya! What an awesome tip!!!! You were the Tutorial of the Week over at Card of the Week.com. You rock -- I can't wait to try this! Ok--I tried this and am soooooo happy with the results. TFS--Your cards are just beautiful--pretty much cased them both. So thank you again for sharing this so easy technique and your gorgeous cards. oh, what a fab idea! Thanks for the tip!